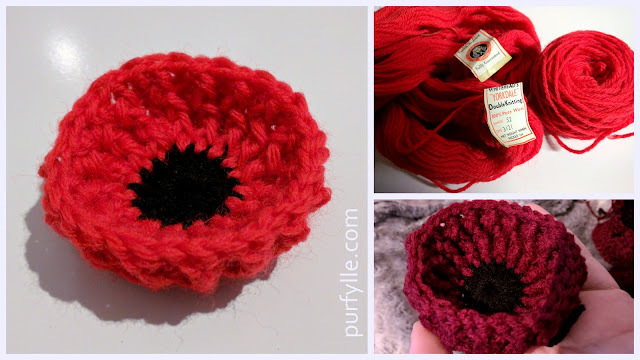 Last week I shared with you the start of my latest crochet afghan. I left you all hanging as to what happened next after I frogged (un-did) all my joins and edging rows to the 5 droplet sections I'd made. My yarn had pretty much run out with only one ball of the pale blue and one ball of the grey left. Hubby drove me down to get some more yarn while the sale was still on. Of course, the dark blue shade had sold out. I bought some more of the light blue and grey, as well as a purple to use instead of the dark blue. It was at this stage of the afghan that I had to farewell my beautiful Sacha-cat. I spent the next few days crocheting through my sadness at her loss, making fast progress on the project. I redid the edge rows. Did I mention that I didn't have quite enough dark blue to edge the final 2 outside edges of my sections? In the end I had to use the new puple colour for that. See the photos further down. I rejoined the 5 droplet sections using the zipper join I had thought looked so good when I first tried it but hadn't worked because of those extra stitches in the peaks of each corner. Now I'm less convinced it was the right choice. Which join do you prefer? With the main centre sections all one piece again I was able to start on the outside edging rows as per the original 'Drop in the Pond' pattern with 2 lots of the 7 row repeat the whole project consists of. I started on the light blue rows for the side edging and got one row done when I realised I would need to pull out the new ball of light blue to do the second row. This is when I discovered that the new ball of yarn was a different light blue to the one I had used throughout the rest of the afghan. The original yarn was called laguana (cool name huh?) and the new one was aqua (whoops). I continued on thinking it will look alright. I got through the first set of 7 rows for the side edging. ...when I realised something was wrong. Somewhere a half dozen rows or so ago I had added a shell into a valley that I should not have added, which meant I now had a gentle wave instead of that zig-zag effect. I frogged those rows and redid them, it was about half a days work. I didn't even stop for a photo, I was deep in crochet therapy and I had it all redone in no time. I hemmed and hawed and stopped and finally looked at my project. REALLY looked at it. That is when it hit me. My ever so careful droplets in a diagonal were not in a diagonal. I had put one in the wrong way around. How? How did I not notice until now? I had been so careful to make sure they were the right way around. 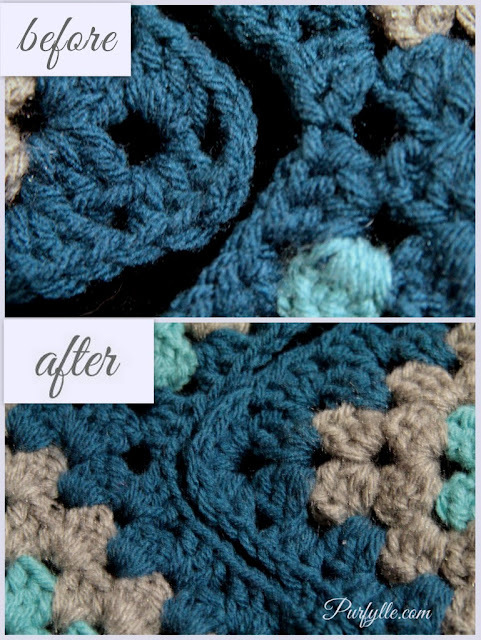 Crochet therapy is good for the soul, but not so great for getting your project right. This project had helped me through saying goodbye to my Fluff Monster but now I'm not happy with it. I don't like the bright blue aqua and that one section that is the wrong way around is driving me crazy. But should I just leave it? I'm not sure I can. I would need to undo the 2 long sides (13 rows each side) and maybe a 3rd to fix it. I'm still pondering. I've purchased 2 more balls (no longer on sale) of the grey so I can remove the blue if I want. In part 3 you'll find out what I end up deciding to do. so complicated! Toss it over the back of the sofa or chair and look at it for a week, then you will know what to do. Time heals all wounds and clarifies all crochet mistakes! I think it looks AWESOME! I really like the aqua and laguana together, they play off each other in a pretty way. I'm probably not the best judge here because when it comes to crocheted blankets I just love colorful and wild things ;) I'm a big fan of mismatched and handmade goodies. I totally understand your frustration, though. It sounds like everything that could go wrong went wrong and all of your yarns ran out, which is never good mid-project! Ain't that the way.. I'm glad it was therapeutic for you and I think it turned out really cool. I'll be interested to see how you changed it in part 3. It's on the backburner for now while I get another project done, but I'll try to get part 3 done soon. I love how you embrace the multicolour goodness! I would have dumped it in the trash long ago!! I want it to be perfect too! But yes the experience was the best therapy and learnt a lot. Ummm... i really cant see where the error is! I always see making something as a learning process as well as therapy. There might be errors along the way but we always learn and improve. That is the beauty of it!! It's that row on the left in the last picture, that square at the top should be at the bottom. It's been a great learning experience. If I hadn't changed the join it would be the right way around. 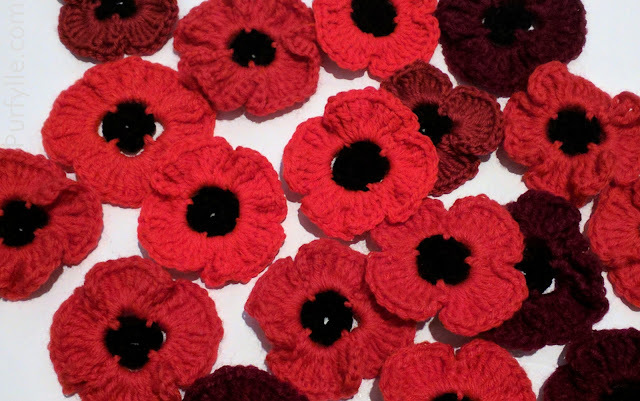 "Crochet therapy is good for the soul, but not so great for getting your project right." What you said is so true. But although we might make mistakes or imperfections, it teaches us persistence. And you have definitely shown that on this project! Persistence is certainly a virtue but knowing when to say it's good enough and move on is an art I have never been very good at. OMG. I actually felt that sick feeling in my stomach that I've gotten when I've made similarly horrific discoveries. Can't wait to see what happens in part 3. If it were me, I think it would have gotten bagged up and put away "on the naughty step", as my friend says, for a while. Probably quite a while. I must say it did take the wind out of me for a bit and it did sit in the naughty corner while I made the chevron throw. I was determined not to have another project end up in the UFO pile though.